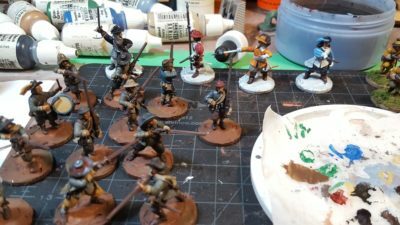 First unit of foot for my English Civil War project is done! 28mm pike from Warlord on 25mm wide bases. Click for larger. Ten pikemen, an officer, and a flag ensign all lined up ready for battle. I’m plugging away at the shot in blue to go along with these guys… the musketeers have a lot more equipment hanging off them and are a lot slower to paint than pikemen! 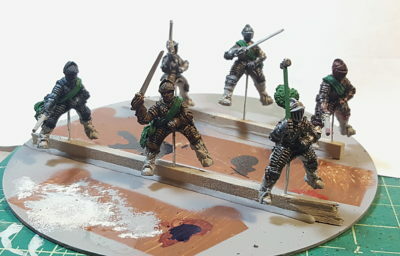 Got a couple of half decent photos of Warlord’s Pike & Shotte Mounted Commander that I’ve got on my painting bench right now, along with a whole bunch of pike & shot soldiers for him to command. This is one of Warlord’s all-metal figures, and very nice too, a good level of detail and a pose full of attitude as he slouches along, pewter wine cup in one hand and a huge broadsword on his hip. There’s an eyepatch under that wide hat too, although I don’t think you can actually see it in these photos! 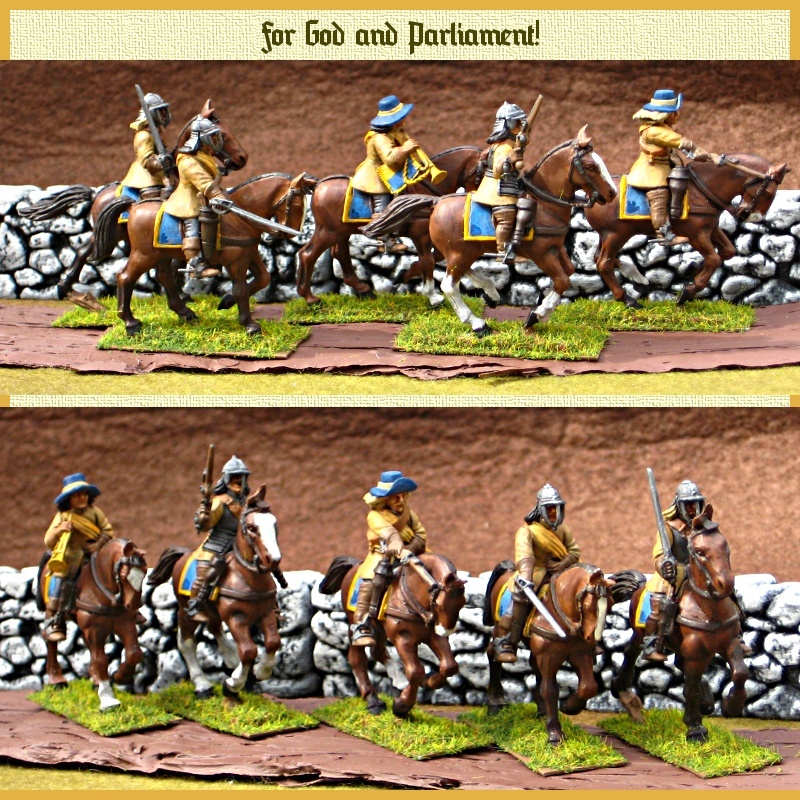 An officer of the English Civil Wars; 28mm figure by Warlord Games. Click for larger. I set myself the painting challenge of doing a black horse, black coat and hat, and black hair on the commander. The clothing is done with a base of Reaper Walnut Brown (a very, very dark almost black brown) with a few drops of Pure Black in it, highlighted with Rainy Grey; the horse is mostly Pure Black with some Walnut Brown highlights and then a coat of artist’s India Ink over the whole horse except the mane and tail. Loads of highlighting and some detail painting left to do, but I’m happy with the progress so far and thought I’d show him off here! 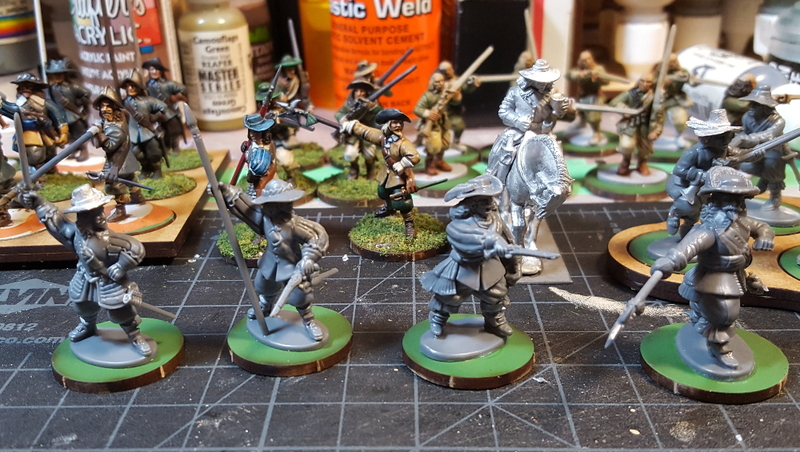 Much chaos in my non-gaming life, so time and brainpower to actually paint is kind of hard to come by, but this weekend I sat down and organized my pike & shot foot figures for Pikeman’s Lament and other English Civil War or Thirty Year’s War gaming. I now have exactly 60 figures assembled, based, and in progress for this project; I know it’s exactly 60 because the 4Ground 25mm bases I’m using come in batches of 60 and I just finished the first batch of two that I’ve bought! All the pike & shot foot so far. See text for details, and click for larger. Starting from the far left, there’s a unit of musketeers in blue uniforms, then a pike unit in blue (on the close-order base from Warbases). To the right off the back edge of the cutting mat is another dozen musketeers, this time in green. 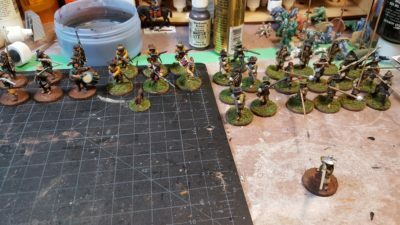 In front of them is six foot characters/officers/leaders and one mounted officer, and on the skirmish base to the right is the first six forlorn hope firelock musketeers. Finally in the front right corner is another dozen pikemen, in green uniforms. All the figures are from the Warlord Games Pike & Shotte range, all plastic from their infantry regiment box. This is one full infantry regiment box plus a couple of extra sprues picked up separately, except for the firelock/forlorn hope figures who are the first of the Forlorn Hope/Firelock Storming Party box I’ve assembled. 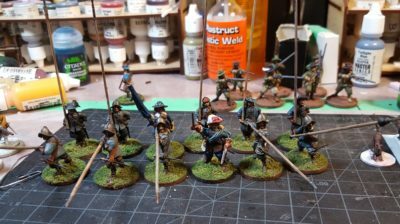 The blue pikes are closest to being done, and a few of the green musketeers got finished as part of LPL11 recently. Most of the bare grey plastic figures were assembled just this weekend to fill out various units and add some more leader/officer/character figures to fill out some units. Four new foot characters, and some finished ones behind. Click for larger. The four new officer/character figures are made with arms from the Warlord plastic pike & shot infantry command sprue, and a mix of pikeman bodies and bodies from the command sprue. The two on the left are pike bodies; the two on the right are command sprue bodies. The two completely finished and based figures in back alongside the mounted officer are also made the same way, with two spare pike bodies. I have more command or character type figures than I’m ever likely to need for Pikeman’s Lament, but they’re fun to assemble and there’s lots of single-figure small skirmish games out there like Pulp Alley that I could see tweaking for an ECW setting! As soon as I saw how the figure on the far right came together I thought about cutting the head of the halberd off and turning it into a magic-user’s staff of some sort! Hmmm, mix and match the fantasy Dragon Rampant with Pikeman’s Lament? Dragon’s Lament? Pikeman Rampant? The two games use the same basic core rules, so it might be possible, and gunpowder/Renaissance fantasy (vs more standard medieval fantasy) has always been an interest of mine! Sunday the 29th of May we got together to do a four-player 1,000pt Field of Glory: Renaissance battle; this was bigger than had previously been attempted and was my first actual game in this period. I badly bent a rule I’ve held to for more than a decade, and fielded unfinished figures (a lot of them, in fact!) to get a force on the table. I had an allied German army of two units of standard pike-and-shot foot, a field commander, and an oversized technically-illegal unit of really good-quality horse (six bases instead of the usual four, all Superior Determined Horse, for the other FoG:R players out there), the rest of our side (centre and other wing) was all German Catholic. Opposing us was a French force, with one wing of allied English New Model Army. An a-historical mashup, to be sure, but a good game. The two allied wings wound up facing each other, my German Prods vs the New Model Army, while the two larger armies fought the other wing and the centre. Photos, a bit more narrative and some thoughts after the jump!